As of 1:07pm ET 26 people confirmed dead; 18 children, 8 adults. 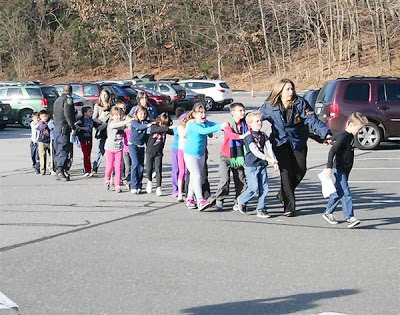 (CNN) -- Two school employees died in a shooting at a Newtown, Connecticut, elementary school, a parent who was inside the school during the incident told CNN. Multiple local media outlets also were reporting more than one fatality in the shooting Friday morning at Sandy Hook Elementary School. Police have not confirmed those reports to CNN. The parent, who has a second-grader at the school, said she believed more than 100 rounds had been fired. More than a dozen people, including elementary school children, were shot and killed at a Newtown, Conn., elementary school this morning, federal and state sources tell ABC News. A shooting involving two gunmen erupted at a Connecticut school this morning, prompting the town of Newtown to lock down all of its schools and draw SWAT teams to the school, authorities said today. State Police confirm that one shooter is dead. A second gunman is apparently at large. Car-to-car searches are underway. It's unclear how many people have been shot, but more than a dozen people including school children are dead, multiple federal and state sources tell ABC News. The shooting comes just three days after masked gunman Jacob Roberts opened fire in a busy Portland, Ore., mall killing two before turning the gun on himself. Today's shooting occurred at the Sandy Hook Elementary School in Newtown, about 12 miles east of Danbury. State Police received the first 911 call at 9:41a.m. and immediately began sending emergency units from the western part of the state. Initial 911 calls stated that multiple students were trapped in a classroom, possibly with a gunman, according to a Connecticut State Police source.